Yep. 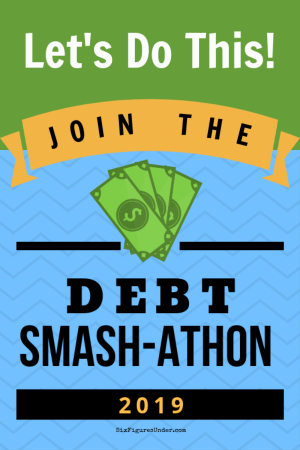 We currently have over $100,000 of debt remaining (and we’ve already paid off over $32,000)! You’re probably wondering how in the world we got into that mess and why you would want to stick around to get tips from me. Well you can read our story to get the whole scoop of how got in this deep. Our friends and family would tell you (without any sarcasm) that we are some of the most frugal and financially responsible people they know. We really do have a simple and frugal lifestyle. Besides taking out student loans to pay for law school, we have a great track record. We have faithfully kept a family blog for the past 8 years, but we decided to set up a separate space to document our journey to becoming debt-free. Besides updates on the progress we are making, we will be sharing lots of tips and ideas for saving money and living a simpler life. Thanks for joining us! For your convenience, you can subscribe to Six Figures Under to receive our posts in your inbox. I know you will find lots of tips and ideas for your own journey whether you are paying off debt, saving for a rainy day, or building wealth. Read about our big fat goal to pay off $100K+ in 3 years.